Although the daily candle has yet to close, it looks pretty promising for the bulls. The market is currently in the process of testing overhanging resistance and is currently testing the strength of both the bulls and bears. Even though the move was strong, it should be noted that we are still trending downward as we continue to make lower highs and lower lows on the daily trend. That’s not to say the trend won’t be broken, but it should be a matter of consideration as we take an objective view of the current market structure. Looming just above the outlined zone in blue is a very important and potentially market-structure changing zone, outlined in red in the figure above. The market has been unable to close above this level for months and has been continuously pushed down with every attempt to rally into the region. If we can see a close inside the red zone, we can anticipate strong buyer interest as this represents a change in the market behavior. This will be a very important level to watch as we continue to see upward momentum push this rally further. Again, it should be noted that we have yet to close the current daily candle above overhanging resistance, but given the spread and volume behind the current move, it seems logical the market is good for a bit of a continuation before the bulls lose steam. The outlined resistance levels in Figure 3 will serve as points of interest in the coming days in order to judge the health of the current market. It’s important to wait for the daily close as the market is known for massive slippage due to relatively low liquidity on some exchanges. 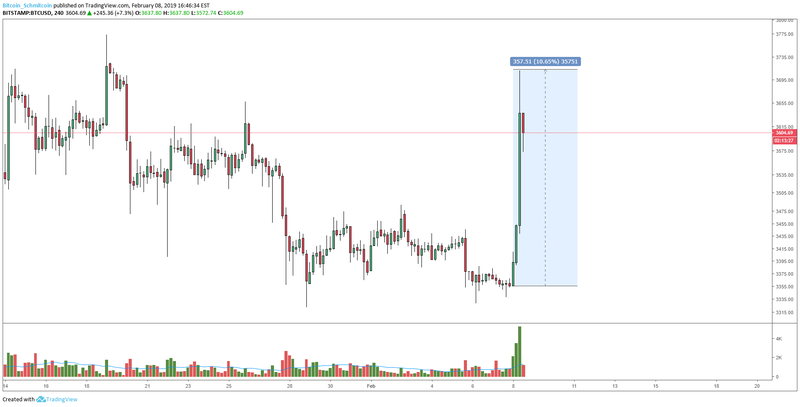 Shortly after the London Open, the entire crypto market rallied on very high volume with relative ease compared to the previous weeks of attempted rallying. Several coins have seen record-setting volume for the current bear market, while others have blown straight through their prior resistance levels. Bitcoin is currently in the process of testing its overhanging resistance as the current daily candle has yet to close. There are major resistance levels to consider when viewing the health of the market, but given the strength of the current move, it seems likely we will see a continuation of the uptrend before bears begin to test their hand against the bulls. Trading and investing in digital assets like bitcoin is highly speculative and comes with many risks. This analysis is for informational purposes and should not be considered investment advice. Statements and financial information on Bitcoin Magazine and BTC Media related sites do not necessarily reflect the opinion of BTC Media and should not be construed as an endorsement or recommendation to buy, sell or hold. Past performance is not necessarily indicative of future results.